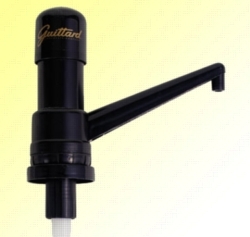 1oz Pump for Guittard Sauces & Syrups helps dispel the piles of dirty cutlery in any kitchen. It will dispense perfect 1oz doses of any sauce or syrup every time, making the dishes look like something out of a cooking magazine. This is how the professional chefs do it - with a Guillard pump, of course! Wowing friends and family has never been easier. Clean with mild detergent only. Do not use water hotter than 120� F.